The HDP6 passive speakers are perfect for stereo receivers, integrated amps, and tube amplifiers. What amplifiers work best with the HDP6? 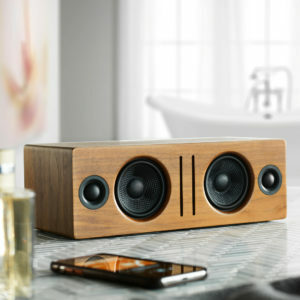 The HDP6 is a very efficient speaker and designed to work well with digital hybrid amplifiers (Class-D, Class-T, etc.) as well as most stereo receivers, integrated amps, tube amplifiers, and whole-house music systems such as the Sonos ZonePlayer 120. The HDP6s have an amplifier power rating of 10-150W per channel, so any amplifier that outputs that power should work great! The HDP6 is rated at 4 ohms but my receiver has speaker outputs listed as 8 ohms. Will the HDP6s work with my receiver? The lower the speaker impedance, the more current (amperage) your amp or receiver will need to provide, but most separate power amps have more than a sufficient power supply and power amp sections for driving 4 ohm loads with ease. In fact many amps will perform better with a 4 ohm load as opposed to 8 ohms if their design is robust enough to supply the extra current. A quick web search will bring up more information on this subject. Can I use the HDP6 passive speakers with the Audioengine S8 sub? Yes! You would just need an amp to supply power to the HDP6 speakers and connect to the S8. Why don't the HDP6 speakers have built in amplifiers similar to the A2+ and A5+ Classic active systems? The HDP6 came about from requests from customers that already have our powered speakers and/or have a music system and needed speakers but wanted the same Audioengine sound from a passive speaker. Can I use your N22 amplifier with the HDP6? The N22 can work with the HDP6s, but we would recommend using the speakers with an amplifier that can provide more power to the speakers than the N22 can provide. There are different theories but rooms and tastes are different so it's tough to specify a correct placement. We suggest you experiment with different locations to see what works for you. As a general rule of thumb for the best sound stage balance, the speakers should be equidistant from side walls and a different distance from rear walls. Our rear-ported speakers (such as the A5+, HD6, and HDP6) pretty forgiving when it come to being placed near walls, but we do recommend keeping them at least a few inches from the rear wall for adequate ventilation.